The recently launched Proba-V miniaturised satellite captured this space wallpaper over the border region of northern Syria, southeastern Turkey and northern Iraq on May 28, 2013. The recently launched Proba-V miniaturised satellite captured this space wallpaper over the border region of northern Syria, southeastern Turkey and northern Iraq on May 28, 2013. 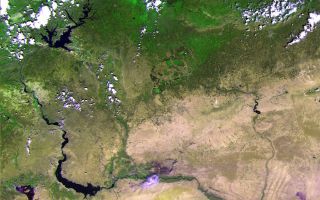 The area pictured is about 310 miles (500 km) across, with large reservoir lakes along the Euphrates River visible on the left, and another along the Tigris River on the right. In the central-right portion of the image, we can see Iraq’s Sinjar mountains. Proba-V will map land cover and vegetation growth across the entire planet every two days with its Vegetation imager. This image was taken on June 24, 2013.